When I first saw Lost In Pain as absolute newcomers at the local Metal Battle competition in 2011, I was excited that teenage kids could play such authentic thrash metal influenced by the classic Bay Area sound. As great as the band acted on stage, they didn’t manage yet to convey their energy on their albums, Lost In Pain in 2011 and its successor Plague Inc. in 2015. 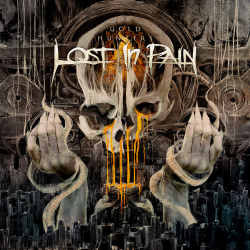 Now Lost In Pain are back with their third album Gold Hunters, and the band is once again back in their original line-up after a short break from their bass player Nathalie. The band is still loyal to their early Nineties influenced thrash metal, but the really good news is that the band has finally succeeded in getting their tremendous live energy on record for the first time. The new album begins with the title track which is also the first single for which the band made a video clip. Not only does the stylish black-and-white short film offer suspense, but the song also delivers thrashy riffs that remind of Metallica’s black album. Hugo’s voice still shows strong parallels to James Hetfield, thus reinforcing the comparisons to the legendary Bay Area thrashers. Despite these probably everlasting comparisons, Lost In Pain have made huge progress when it comes to songwriting. The songs are more varied than ever before, with fast, groovy and melodic moments switching back and forth. The band has definitely become more mature, and even manage to handle longer material. Revolt for instance makes it over seven minutes and is a good example to show how at ease the band is at mid-tempo material. The next-to-last track God Of Destruction is a very quiet track that might be seen as a tribute to Nothing Else Matters. The album ends with The Great Illusion, a relentless rocker where Lost In Pain can let it all out. It is often said that a band’s third album is a make-it-or-break-it situation. This was the case for many pioneering Bay Area thrash bands (Metallica’s Master Of Puppets, Slayer’s Reign In Blood and Anthrax’s Among The Living), and even though Lost In Pain might never play in that same league, I am happy to say that in their tenth year as a band, they have finally managed to release their best album yet. Let’s hope that the band will keep on with that same energy and passion.